Navratri festival is around the corner. So I have shared 9 simple Navarathri kolam designs for 9 days. I have given kolam with dots & without dots. 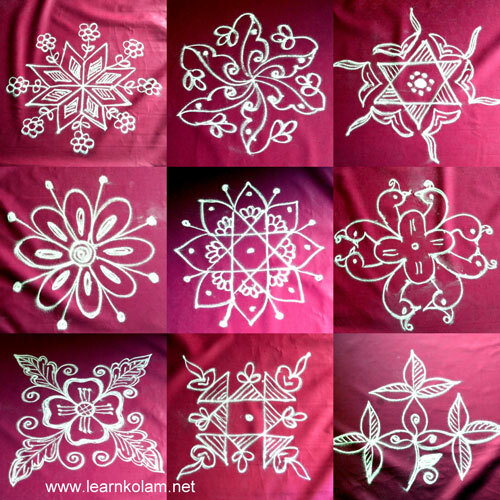 I hope these kolam ideas would be useful for beginners. You can draw these rangoli designs in front of Golu/Kolu or in your pooja room. You can colour them if you like. Please watch the video below for better understanding. I have also shared more than 10 different navratri kolam ideas for drawing in the entrance of your house. I will try to make a collection of them soon. Thanks. I really liked your post. This thing is amazing. I just saw the video and I really liked it. Thank you so much for shaing this post with us.